According to PolitickerNJ, State Senator and Union City Mayor Brian Stack will endorse Gov. Chris Christie today for re-election this November. The endorsement is not a surprise considering the positive relationship between the State Senator and Governor such as state pension reform. Of interest though is Brian Stack's handpicked selections for Assembly who are expected to also join in endorsing Gov. Chris Christie. Hoboken's Carmelo Garcia who holds multiple paid positions in the public sector should be on hand when the announcement is made. 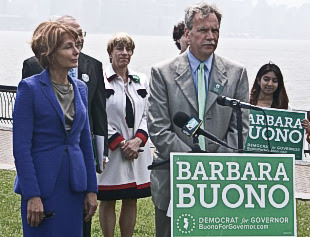 He's expected to deliver his Hoboken Housing Authority followers vote for the popular Governor. Will Hoboken be seeing Gov. Chris Christie posters in HHA windows? Statewide other Democrats are falling into the Gov. Chris Christie column with the latest statewide poll showing Christie far ahead of his main Democratic challenger. other than a few young astroturfers was Councilwoman Beth Mason. Is that the kiss of death or what? Assembly leader Sheila Oliver is ready to throw her hat in the ring for the US Senate seat giving frontrunner Newark Mayor Cory Booker another challenger in the Democratic primary. Photo courtesy NJ.com, by arrangement.